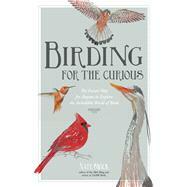 Birding for the Curious is the perfect gift for the nature-lover in your life, or an excellent introduction to birding for you. It won't be long before you can easily recognize and name the common birds in your area. With this book, you will enjoy nature at a whole new level. Nate Swick has been a birder for over 10 years. He is a member of the American Birding Association and blogs for 10,000birds.com, the ABA blog and his own blog, The Drinking Bird. Additionally, Nate leads trips for the Carolina Bird Club and serves on the North Carolina Bird Records Committee. He lives in Greensboro, North Carolina.